on February 21st at 10:54pm, Nanette said "This is a cool release! I love the sample cards I've seen so far and I can't wait to get my hands on them so I can play with them!" Lisa Adametz - mjmarmo on February 28th at 5:48pm said "Simply delightful!!!" Sandy Allnock - Debbie Scassera on February 24th said "I think everything is amazing!" Laurel Beard - Nichole Taylor on February 26th at 8:25pm said "So fun!! The lipstick is just so cute!" Heather Campbell - Terri Bradburn on February 21st said "So sweet! Love your color choices." Kittie Caracciolo - Sue McRae on February 21st at 8:53pm said "Your work is always beautiful and you have such a great eye for detail." Darlene DeVries - Cynthia Cole on February 24th at 1:06pm said "Love your cards!" Julie Ebersole - Tracie Pond on February 22nd at 7:35pm said "Thank you for designing amazing product. Love the background stamps and thanks. =)"
Michele Ferguson - McStamper on February 22nd at 10:31pm said "Great cards. Love the deer." Kelly Griglione - Ina Nelson on February 21st at 2:54pm said "Wonderful overload of ideas. You know this is a wonderful release when you see so many amazing cards made from the products." Sharon Harnist - Linda K on February 21st at 2:19pm said "delightful cards!" Brandi Kincaid - Donita Behrends on February 24th said "love that inside and out background"
Stephanie Klauck - Lisa on February 21st at 3:42pm said "I can not believe I'm going to have to buy a nail polish stamp set. This is ridiculous, but YOU MADE ME DO IT. :)"
Emily Leiphart - Liz O. on February 21st at 11:34am said "Absolutely adorable, I been wanting to get the swing and slide dies for interactive cards and the new stamps are just perfect too! I love the cuddly party and jumping deer, thanks for sharing Emily!" Jennifer McGuire - Patricia M on February 22nd at 4:28am said "The background stamp set looks very versatile!" Heather Meeson - Teresa Adams on February 21st at 4:58pm said "The otter card is so cute. I like the thank you card because it would be Geary for guys too." Carly Tee Minner - Cindy Aguirre on February 21st at 9:56am said "Great cards! Love the lipstick writing the heart! Very clever!" Carolyn Peeler - Susan Hatfield on Febraury 21st at 3:17pm said "I love Ellen's releases and this is a fun one. Cute cards!" Nichol Spohr - Belt Holt on February 21st at 12:27pm said "Those otters are just too cute! Love your cards - you do such a fantastic job with all of your videos!" Julia Stainton - Lisa on February 21st at 4:11pm said "These are amazing. And make me want these sets even more. And yes, that wire thread? MUST investigate. :)"
Carissa Wiley - Judie on Febraury 26th at 10:56am said "Awesome cards! Love the colours of the first one!!!" Congratulations to all of you, and thank you to all who entered! Be sure to follow the board so you will always have those inspiring ideas close at hand! Thank you so much for the enthusiastic response to our Essentials by Ellen Holiday 2016 Release! We could not be more thrilled to know you like them!!! Welcome to the Essentials by Ellen Holiday 2016 Release Blog Hop! This latest batch of stamps and dies are exclusive to Ellen Hutson LLC and are available right now in the shop! LINK: To view in HD on our YouTube Channel click HERE! Thanks for watching, subscribing, and giving us a thumbs' up! We strive to produce stamps and dies that are designed to compliment and cross-coordinate with each other, as well as with products from previous releases for maximum versatility! As with all our exclusive stamps and dies, they will come in our signature packaging. You can see the whole release in greater detail over in the shop! For a chance to win the whole kit & caboodle, just leave a comment on this post by Tuesday, October 25th. And, each participating designer in our hop is also giving away the choice of any Essentials by Ellen stamp set in stock (maximum value $25 USD), so leave them some comment love by Tuesday, October 25th. All winners will be drawn and announced here in the CLASSroom on Friday, November 4th. Comfy? Cozy? Hot cuppa in hand? You are ready! We're playing along in the Altenew Blog Hop as they celebrate their 2nd Anniversary! We are thrilled to carry the Altenew product line in our store and are excited to share in the fun today! Leave comments along the way for the opportunity to win one of THREE prize packs valued at over $100 from Altenew! Be sure to leave comments on each stop by Tuesday, April 12, 2016 at 11:59 PM EST for a chance to win! 13 winners will be chosen at random from the collective blogs in the hop list and will be announced on the Altenew blog on Apr 14th. There are many stops along the way - your next stop is the talented Amy Gray! I love advent calendars, and think they are such a fun part of the holiday season, especially for the kiddos! This particular project is an advent that includes a fun activity (in lieu of candy or prizes, etc.) for each day in December leading up to Christmas. This project is a full 8.5 x 11" page design, made possible with the Big Shot Plus, which has a 9" feed. You could certainly modify the project to accommodate fewer days or a different sized format, but I really wanted to try a full page and you shoulda' seen the bouncin' and monkey clappin' goin' on 'round here when I finished it! *fist pump* Oh, my word I love that Big Shot Plus even more now...!!! Link: Watch in HD on our YouTube Channel HERE & give it a thumbs up! You'll see in the video how I quickly/easily made adjustments to the little windows to ease popping the doors open. This is not a necessary step--you could also pre-snip the little webbing that holds the doors shut, if you wanted, or use mini brads to create tiny door "knobs" on each of them--seriously, how stinkin' cute would that be? It’s not a party without a prize - and with prizes every day there are several chances to win! 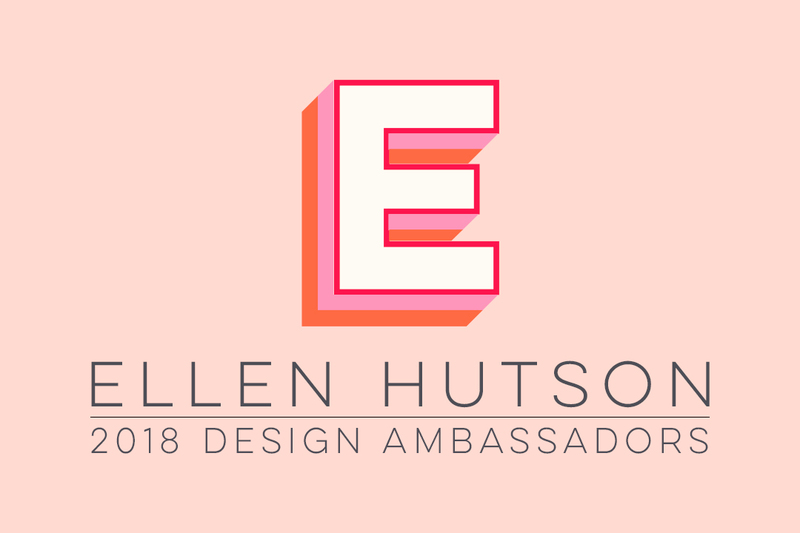 Today’s prize is generously supplied by Ellen Hutson LLC so you’ll definitely want to get your hands on it! Simply leave a comment on this post to enter - then head back to taheerah-atchia.com and leave a comment there too to double your chances! Don’t forget to grab the other surprise destinations from Taheerah’s blog and head over to them to leave comments there as well to improve your odds even more! You have until 7am EST on Thursday 31st December to leave all your comments! Don’t forget the Advent Calendar Extravaganza runs from 1st-25th December inclusive so make sure you visit taheerah-atchia.com every day for fabulous inspiration and amazing prizes every single time! And, hey, just because y'all are so fabby, in addition to the prize over at Taheerah's, we are giving away the Advent Stamp Set & matching Advent Dies to a lucky commenter here! WOOT! Hi everyone! It's Lisa and if you've been hopping along on the Inklipse 1,000 Subscriber Blog Hop...THIS is your last stop of the hop! You should have arrived here from the lovely Laurel Beard's blog (whom I'm sure you all know very well here in the CLASSroom). Simon is having a HUGE giveaway to celebrate and Ellen Hutson, LLC is even sponsoring the hop with a gift certificate. You must hop, comment, and enter to win, and the winner will be chosen by Rafflecopter on the Inklipse blog. Got all of that? Great! The theme for this blog hop is near and dear to my heart. WATERCOLOR. I know. Take a moment. I know I did. I kinda squealed when I found out. (But don't tell anyone...well, now you all know, but keep it to yourselves, okay?) I kind of have a "thing" for anything watercolor-y. I just love being able to move the colors around and then watching them do what they do. It's a bit mesmerizing. And there are just soooo many products out there now!! It makes it so easy for anyone to start playing. Let me take you through the steps on how I put this together. I used the Inkadinkado Embossing Magic Bag and prepped my entire piece of watercolor paper (smooth side) and then stamped all of my images using Versamark Ink. Gold Embossing Powder is then poured over the entire surface, sticking to the Versamark ink. Tap off the excess and pour back into the container. Next you admire your watercolors. No, I'm just kidding. Well, sort of. Decide which watercolors you are going to use. There are so many options these days and I really love the Kuretake Gansai Watercolors so that's what I chose to use. That being said? I also LOVE using watercolor pencils, Gelatos®, and I'm just trying out the Peerless watercolors, too. Spritz over the colors that you'll be using with a mini mister. Have a cup of water and watercolor brush ready. And start painting! Get your brush wet and pick your first color as you'll see in my next photos, I do what *I* like. Each time I create something is very different. Allow the color to drip, move, and blend. I wasn't going to completely cover the paper, but then I went ahead and did it anyway. I really loved these colors all together with the gold embossing powder serving as a resist. In the photo below the paper is still very wet. Now the paper is dry and you can see that the color has softened and become a touch more muted. Focusing on the sentiment now! I'm using the Essentials by Ellen Designer Dies, Merry & Bright, By Julie Ebersole. Let me just say that there are SO many options on how to use these dies. It really is an "essential" die set for the holidays. I centered the dies how I wanted them on some beautiful Gold card stock, and put some low-tack tape on top to keep them from shifting. Cut a piece of vellum, tear the edge, and adhere to the back of the water-colored panel. Adhere the die-cut "Merry & Bright" and do (what I call) a dry fit of your other pieces. This gives you time to fuss, before you adhere everything down. Ellen Hutson (Lisa Adametz) <-- YOU ARE HERE!! Have a wonderful weekend and happy hopping! Welcome to the Essentials by Ellen Holiday 2015 Blog Hop! We're pretty excited to unveil these fab new stamps and dies, created by Julie Ebersole, exclusively for Ellen Hutson, LLC to you today! The holidays will be upon us before you know it so we're getting a jump start to allow plenty of time for creative fun with our Holiday 2015 release! We've put a fun twist on some traditional holiday themes, including hand painted florals and greens, autumn goodness, cheeky Santa's helpers and there's even something in there for the treat or trickster... *grin* There are 5 stamp sets and 5 matching die sets, all designed to compliment and cross-coordinate with each other as well as with products from our previous releases! As with all our exclusive stamps and dies, they will come in our signature packaging, and the entire release is now available in our store! To celebrate, we've got an amazing line up of industry friends and talented designers who are joining us for a FAN•STAMP•MAGORICAL hop so grab a "refreshing" beverage, and prepare to take in some inspiring eye candy! ...How would you like the whole lovely lot to come live at your house? Hey, who wouldn't want a whole lot o' lovely???!!! One lucky winner will get to experience precisely that! To enter the drawing for this Grand Prize Package, please leave a comment by August 11th! A winner will be drawn and announced by the weekend. That's not all, folks! Each participating designer in our hop is also giving away a brand new stamp set from the release! WOOT!!! Please leave a comment at each of their blogs by August 11th to enter their drawing! Thank you for joining us, and many thanks to the designers who are sharing their talents with us! Kittie Caracciolo - TRICIA B. Keep scrolling for a chance to win $50 to our store by participating in our new challenge! Welcome, welcome to the Essentials by Ellen Winter 2015 Release Hop! We're so pleased to unveil our newest collection to you today! Bold florals, brush script sentiments, elegant thank you's, and whimsical birthday greetings are the focus of this latest collection of stamps and dies created by Julie Ebersole exclusively for Ellen Hutson, LLC The entire release is now available in our store! All Essentials by Ellen Stamp Sets and Dies arrive to you in our signature packing with a durable clear envelope and labeled card stock backer for easy storage and organization. Our die storage also features an attached magnetic sheet, to keep even those tiny dies stored securely! To celebrate, a talented group of industry friends and designers are joining us for a FANTASTIC hop, so grab a cuppa, and get ready swoon over all the gorgeous eye-candy they are presenting today! Would you like the whole shebang to come live at your house? To enter the drawing for this Grand Prize Package, please leave a comment by March 2nd! A winner will be announced March 4th. That's not all, folks! Each participating designer in our hop is also giving away a favorite stamp set from the release! WOOT!!! Please leave a comment at each of their blogs by March 2nd to enter their drawing! Those winners will also be announced March 4th.